But we can get a virtual experience. 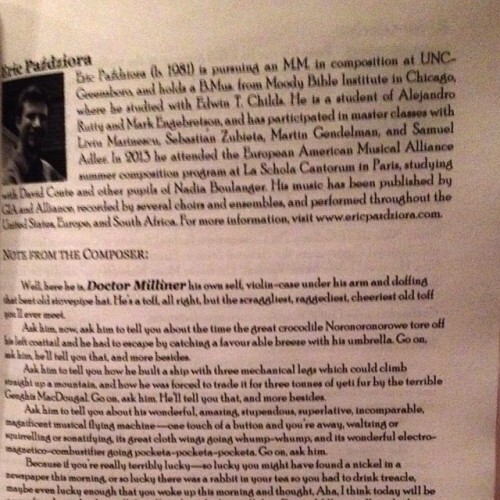 Eric tells me that my programme notes take up most of the page. Which is a rather dubious honour, I guess, so I’ll be proud of it. I need more dubious honours. Again, proof via iPhone, after which I’ll put those self-same notes I wrote, and a recording of the world premier of the piece. If you watch this in the next hour or so, it’ll be pretty much just like being there, except on a different stage with different performers in the comfort of your own home. You may even want to read the programme notes aloud, which they’re also doing in DC just about now. Apparently so they have time to hand out the noisemakers. The management requests that whenever you hear the words MUSICAL FLYING MACHINE or THE GREAT GOD PAN IS DEAD, please use the complimentary whatchamecallums—noisemaker thingies—to make a VERY LOUD NOISE, in fact a HULLABALLOO, until you hear the sound of the POLICE WHISTLE. This will happen more than once during the course of the piece, so please do retain your whatchemecallums during the interval. You’ll find they make excellent gifts for the small children of people you don’t like. Well, here he is, DR MILLINER his own fine self, violin-case under his arm, doffing that bent old stovepipe hat. He’s a toff, all right, but the scraggliest, raggediest, cheeriest old toff you’ll ever meet. Ask him, now, ask him to tell you about the time the great crocodile Noronoronorowe tore off his left coattail and he had to escape by catching a favourable breeze with his umbrella. Go on, you ask him. He’ll tell you that, and more besides. Ask him to tell you how he built a ship with three mechanical legs which could climb straight up a mountain, and how he was forced to trade it for three tonnes of yeti fur by the terrible Ghengis MacDougal. Go on, you ask him. He’ll tell you that, and more besides. Ask him to tell you about his wonderful, amazing, stupendous, superlative, incomparable, magnificent MUSICAL FLYING MACHINE—one touch of a button and you’re away, waltzing or squirrelling or sonatifying, its great cloth wings going whump-whump, and it’s wonderful electro-magnetico-combustifier going pocketa-pocketa-pocketa. Go on, you ask him. Because if you’re really terribly lucky—so lucky you might have found a nickel in a newspaper, or so lucky there was a rabbit in your tea so you had to drink treacle, maybe even lucky enough that you woke up this morning and thought, Aha, I think today will be a very fine day indeed—well then. If you’re as lucky as all that, Dr Milliner will jingle the jewels he keeps in his pocket, and look thoughtfully at the vast monstrosity of a balloon straining above his FLYING MACHINE. Then he’ll straighten his moth-eaten tie, tap his long nose just so, and wink. And if you’re so lucky as all that, then Dr Milliner just might give you a ride in his astounding, astonishing, appalling, amazing, apparently incomparable magnificent MUSICAL FLYING MACHINE. If the melodica gets restless, give it a thump, it’ll work itself out. If the chord bats start to gnaw on the balloon, well haul away on the whatjamadingle there, and they’ll scatter like song sheets. And if—just if—not to say it hasn’t happened before, because would I tell you if it had?—if Dr. Milliner tries to take you to the moon—well, hang tight to his one remaining coattail and pray that his umbrella doesn’t break when you jump from the deck, in the shower of sparks and cogs and gears and things that ping and pocketa and squeak, and plunge back down the green, welcoming earth. Copyright © 2012 John Patrick Pazdziora. All rights reserved. 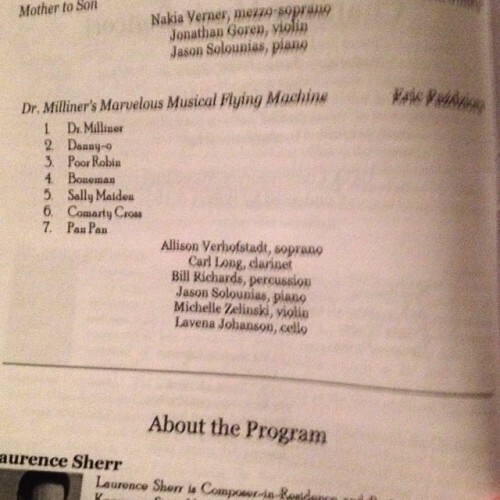 Doctor Milliner, Eric Pazdziora, lyrics, Marvellous Musical Flying Machine, New Music, New Voices @ CUA, what kind of shlimazl do you take him for?